陆苑, 潘洁, 杨淑婷, 吴琼, 刘春花, 李勇军, 刘亭. 艾迪注射液对肝癌大鼠谷胱甘肽-S-转移酶的影响[J]. 中国药理学通报, 2018, 34(8): 1170-1174. LU Yuan, PAN Jie, YANG Shu-ting, WU Qiong, LIU Chun-hua, LI Yong-jun, LIU Ting. 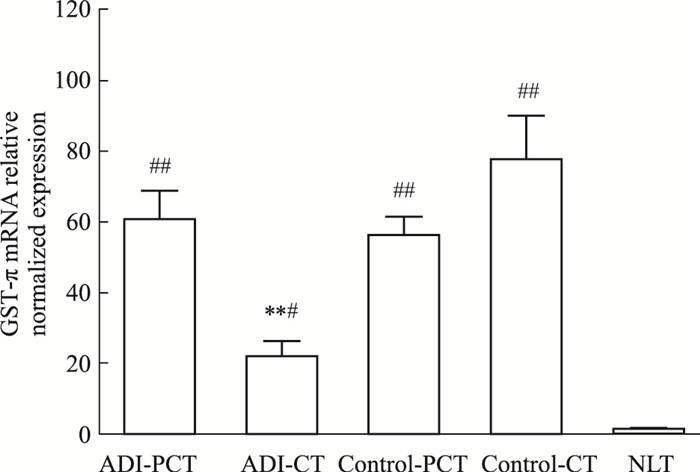 Effect of Aidi injection on glutathione-S-transferase of diethylnitrosamine-induced hepatocellular carcinoma model rats[J]. Chinese Pharmacological Bulletin, 2018, 34(8): 1170-1174. Abstract: Aim To investigate the effects of Aidi injection (ADI) on the serum levels of ALT, AST, TBil and ALP, the activity of GSTs in liver, mRNA and the protein expression of GST-π in hepatocellular carcinoma (HCC) model rats. Methods The HCC model was induced through the oral administration of diethylnitrosamine (DEN) for 130 days in low dose, and validated by HE pathological sections. Then, the rats were divided into normal group, model group and model-ADI group. Normal saline was given to normal group and model group for 14 days, respectively. Then ADI was given to model-ADI group for 14 days. Lastly, biochemical indicators (ALT, AST, TBil, ALP) were tested in three groups. Ultraviolet visible spectrophotometry was used to determine the OD value of the bonder of reduced glutathione(GSH) and 1-chloro-2, 4-two nitrobenzene(CDNB) for the evaluation of GSTs enzyme activity in liver tissues. qRT-PCR and Western blot was used to determine the expression of GST-π in normal liver tissues, para-cancerous tissues and cancerous tissues of rats. Results The HCC model was established successfully. The levels of ALT, AST, TBil and ALP were down-regulated markedly in the serum of HCC rats by ADI. In addition, the enzyme activity of GSTs, and the mRNA/protein expression of GST-π were reduced significantly by ADI. Conclusion ADI could reduce the activity of GSTs through down-regulating the expression of GST-π in HCC rats, which may be the underlying mechanism for the synergistic effect of ADI. 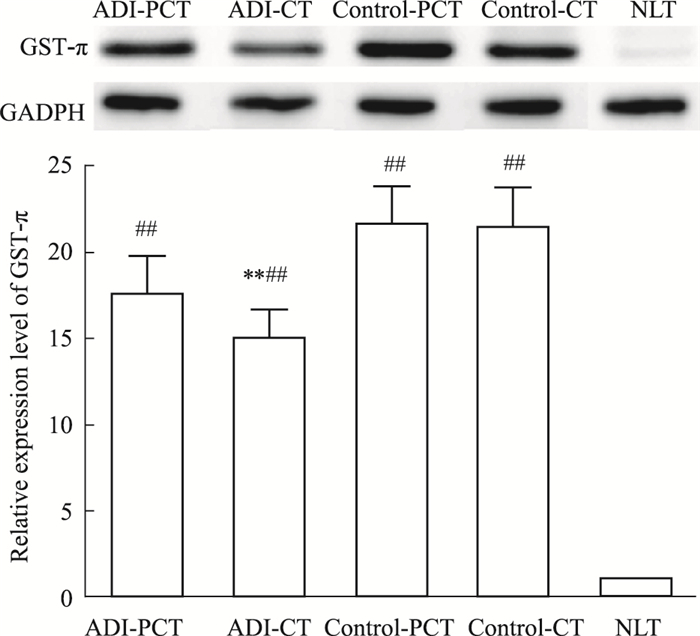 Conclusion ADI could reduce the activity of GSTs through down-regulating the expression of GST-π in HCC rats, which may be the underlying mechanism for the synergistic effect of ADI. Fig 1 Livers of normal group and HCC model group A: Normal group; B: Model group. Fig 2 HE staining of tissue sections(×200) A: Normal group; B: Model group. Xu H X, Huang X E, Li Y, et al. A clinical study on safety and efficacy of Aidi injection combined with chemotherapy[J]. Asian Pac J Cancer Prev, 2011, 12(9): 2233-6. 程宏文, 骆明莲, 江涛, 等. 艾迪注射液联合FOLFOX4化疗治疗原发性肝癌疗效观察[J]. 现代肿瘤医药, 2012, 20(4): 777-9. Cheng H W, Luo M L, Jiang T, et al. Effect of Aidi injection combined with FOLFOX4 chemotherapy in the treatment of primary liver cancer[J]. J Mod Oncol, 2012, 20(4): 777-9. 冯献明, 付方现, 刘俊叶, 等. 艾迪注射液联合5-氟尿嘧啶加顺铂化疗方案治疗中晚期肝癌[J]. 新乡医学院学报, 2010, 27(3): 273-5. Feng X M, Fu F X, Liu J Y, et al. Aidi injection combined with 5-fluorouracil and cisplatinum for advanced liver cancer[J]. J Xinxiang Med Coll, 2010, 27(3): 273-5. 王沛, 李晓天, 张莉蓉. miRNAs对药物代谢酶的转录后调控[J]. 中国药理学通报, 2015, 31(8): 1037-40. Wang P, Li X T, Zhang L R. The post-transcriptional regulation of microRNAs on drug metabolic enzyme[J]. Chin Pharmacol Bull, 2015, 31(8): 1037-40. Ricci G, De Maria F, Antonini G, et al. 7-Nitro- 2, 1, 3-benzoxadiazole derivatives, a new class of suicide inhibitors for glutathione-S-transferase. Mechanism of action of potential anticancer drugs[J]. J Biol Chem, 2005, 28/0(28): 26397-405. Seitz G, Bonin M, Fuchs J, et al. Inhibition of glutathione S-transferase as a treatment strategy for multidrug resistance in childhood rhabdomyosarcoma[J]. Int J Oncol, 2010, 36(2): 491-500. 罗明, 贺平, 吴孟超, 等. 苦参碱和氧化苦参碱对二乙基亚硝胺诱发大鼠肝癌作用的影响[J]. 中国药理学通报, 2000, 16(4): 416-7. Luo M, He P, Wu M C, et al. Effects of matrine and oxymatrine on DEN induced liver cancer in rats[J]. Chin Pharmacol Bull, 2000, 16(4): 416-7. 朱艳志, 孔宪炳, 颜朗. 间断给药DEN诱导大鼠肝癌模型建立及病理研究[J]. 重庆医科大学学报, 2010, 35(12): 1843-6. Zhu Y Z, Kong X B, Yan L. Establishment of hepatocarcinoma rat model induced by diethylmitrosamine discontinuously and pathological study[J]. J Chongqing Med Univ, 2010, 35(12): 1843-6. Chinese Pharmacological Bulletin, 2018, 34(8): 1170-1174.